When I was diagnosed with breast cancer, Bob and I had just moved to Brooklyn, NY. We are self-employed and at that moment, rebuilding our photography business. So we needed work, right away. Hearing the news about my breast cancer diagnosis freaked us out (why wouldn’t it!). We were in extreme panic mode, and could barely stop to ask ourselves, “what are we going to do and where do we start”? What Are Going to Do with this Breast Cancer ‘Thing’? The “what are we going to do?” covered not just the financial concerns, but learning the language of cancer, filling out multitudes of paperwork and searching for an excellent surgeon and oncologist in a city where we knew only a handful of people. But we were fortunate. We have a large, loving family and a supportive group of friends, all of which opened their heart and arms from our hometown of Arizona to my family in Michigan to our new local friends here in New York. Once we calmed down, something haunted us – what if a person doesn’t have that kind of support? What does someone do when faced with a diagnosis of cancer? Alone. No insurance. No support network. Where do they find the assistance they need? Who helps them in their moment of panic? Bob and I didn’t have answers, but the questions remained. Years later when The Tutu Project went viral, we saw that with the money we were raising, we had an opportunity to help the men and women lacking the needed support. In order to keep our costs as low as possible, we decided to partner with organizations that already have the infrastructure to distribute the funds we raise. This year is our FIFTH YEAR anniversary as The Tutu Project, and we are ecstatic to announce our 2017 grant recipients! 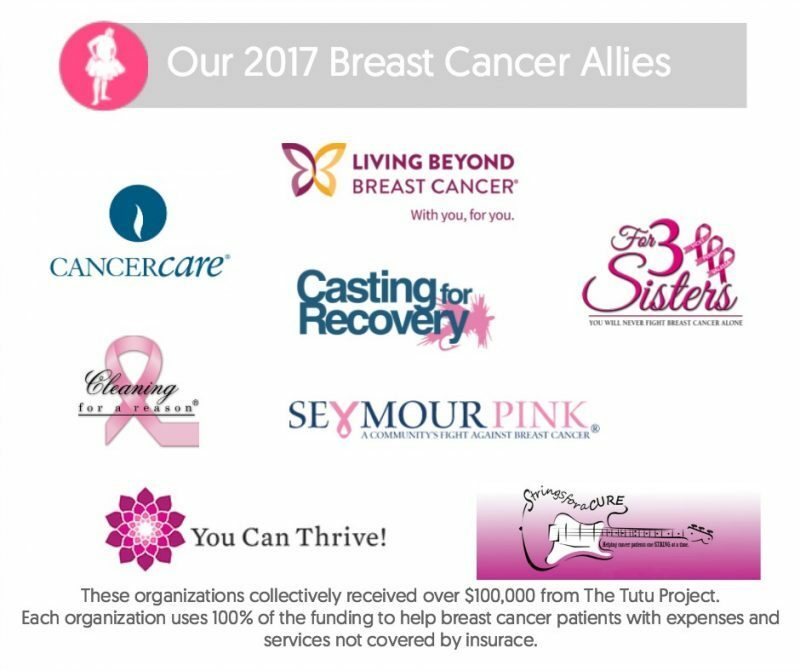 We’ve joined forces with Living Beyond Breast Cancer, For3Sisters, CancerCare, You Can Thrive, Cleaning for a Reason, Casting for Recovery, StringsforaCURE® and Seymour Pink. This is going to be a stellar fifth year! Learn more about them on our Breast Cancer Allies page, and contact us directly via Facebook messenger if you are a breast cancer patient and need access to any of these wonderful organizations. Details about their grants will follow in individual blog posts soon! Thank you to the corporate partners and individual donors that make these grants possible. Without all of you, there would be a little less hope in this world.